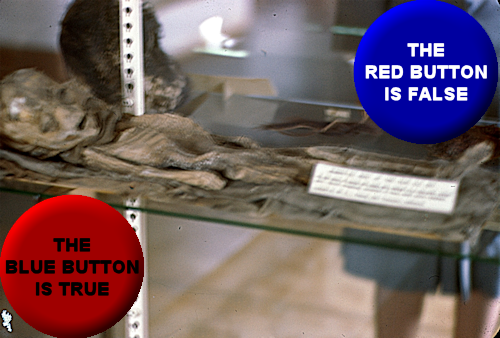 In the aftermath of the so-called Roswell Alien Slides being positively identified as that of a child mummy, which resided at the Mesa Verde Museum (in Colorado) and with co-promoter Anthony Bragalia’s mea culpa and apology, there’s been a slow drum roll while all have been awaiting a response from the remaining key proponents, i.e., Tom Carey, Don Schmitt. That day was yesterday (5-12-15); however, staying in line with the mold cast for the Roswell Alien Slides fiasco, we have conflicting and or morphing commentaries. Curt Collins of the Roswell Slides Research Group (RSRG) issued their rendering of the placard, (detailing the child mummy in the image) on the 8th (5-8-15); the next day (to his credit) Adam Dew released (the long awaited) hi-res scan of the placard, cropped from one of the slides. Shortly thereafter, using that image from Dew—with no question concerning provenance, I did my own processing and rendering, using SmartDeblur, which of course concurred with Collins’ (& Co) findings. (Important to note that this was done from scratch, not using any pre-designed models). Since that time dozens (if not more) have replicated the process (thanks to Isaac Koi providing “How To” instructions for the lay person); including David Rudiak, who has been cited time and time again by the Roswell Slide promoters in support of the spectacle that took place in Mexico City. • Adam Dew published an article at his Slides Box Media site proclaiming that RSRG “photoshopped” the original (5-10-15). This article has since been removed (although copies have been saved). • Anthony Bragalia penned a piece published at the UFO Conjecture(s) site entitled, “The Answer to the Roswell Slides Mystery: Mummy or Humanoid?” (5-9-15) and wrote, “. . . Evidence is now accumulating that rabid slide-skeptics may have even committed photo-fraud to discredit these slides.” It too has been removed. • Jaime Maussan has also attempted to defend the alien hokum in statements and multiple tweets; in one instance he writes: "There are interests that said already proved to be a mummified child. That's not true we are still preparing a respusta." As the hours have ticked by and the inevitable truth sets in for the Roswell Slide promoters, we see the denials begin to wane and the finger-pointing becoming rampant. Yet the damage is done. The worst example of self-inflicted exacerbation to Ufology generally speaking, and to Roswell research specifically, has come to pass. You've done a great job covering this story, Frank. I particularly appreciated this and the last post you personally made. Slides promoters blocked efforts to verify circumstances surrounding their sensational claims from the get go and at every turn. To now suggest they have been the victims of forgery, or that it is unreasonable to cast a skeptical eye upon this embarrassment to rational thinking, is insulting virtually beyond description. Thanks for documenting it. A job well done! As I told Dew back in February-March: I'm relatively certain I can put this thing to sleep, assuming I had high res scans of the slides, or at the very least a portion of them. . . . The slides and or portions thereof (the placard), would go no further then me; however, if permission is granted to do my own analysis, then I would request that any high res scans sent my way, be done–without any strings attached. I would want to publish my results immediately, and put it out for peer review. . . . At this point, if the goal is to determine the origin of the slides and or what they depict, I would simply state that you have nothing to lose. Having been familiar with SmartDeBlur since its release (years), I had both Home & Pro versions at the ready, along with a few other de-blur programs (and other tools). When I did process Dew’s release, starting from scratch and not using any models—it took a matter of minutes to render and make the top line legible. Later, further effort resulted in more progress. At the end of the day—the sham could have been prevented and money saved. However, it seems that those involved didn’t want anyone to look behind the curtain. Although the whole mess is quite sad, I do find it humorous that for months and up until a few days ago the slide promoters were using the pronouns such as, “I,” “me,” and “my” in regards to their big find; now—they’re all pointing fingers at the next guy, or the so-called “experts” that advised them! This is Ufology’s Piltdown Man; however, Ufology is the only place these guys can get away with this charade. Maussan is the PT Barnum of Ufology ad he is Teflon in this matter, and I predict Schmitt & Carey will be keynote speakers come this July at Roswell. (ad nauseam). > Ufology is the only place these guys can get away with this charade. On the "research as entertainment" level, yes. Sure, there were point-scoring digressions on both sides, but people are people.